It’s our great pleasure today to introduce Amanda Mortwedt Oh as an IntLawGrrls contributor. Amanda is a licensed attorney whose research focuses on North Korea and human rights law. Since joining The Committee for Human Rights in North Korea (HRNK), where she is Project Officer and Development Associate, Amanda authored a report that was submitted to the UN Commission of Inquiry (COI) on Human Rights in North Korea on behalf of HRNK and assisted HRNK’s co-chair, Dr. Roberta Cohen, with her expert testimony on the “gender dimension” of North Korean women in detention. Amanda is the author of a book chapter for World Without Genocide and published a law journal article about human rights law and accountability in Cambodia. She holds a Master of Laws in International Law degree from The Fletcher School of Law and Diplomacy at Tufts University, where she studied “North Korean State and Society” and wrote a thesis on North Korea and transitional justice. Special Rapporteur Eduardo Valencia-Ospina recognized her in his Sixth Report On The Protection Of Persons In The Event Of Disasters, A/CN.4/662, for her research on regional disaster relief plans. 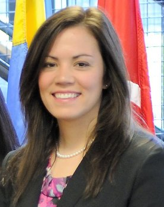 Additionally, Amanda has ten years of strategic communications experience in the U.S. Army, where she has worked with the ROK military in South Korea and was seconded to the U.S. embassies in Cambodia, Thailand, and Afghanistan. She is also currently an attorney in the U.S. Army Reserve Judge Advocate General’s Corps. Amanda’s first post will focus on the one-year anniversary of the report of the UN Commission of Inquiry on Human Rights in North Korea. Heartfelt welcome! Thanks for this update on the follow-up to the work of the Commission of Inquiry on Human Rights in North Korea. I would be very interested in your view on the level of discussion so far related to the substance of the allegations. Is the debate so far mostly related to the general aspects of the existence of the claims by the COI or has there already been a substantive debate of the Commission’s legal analysis (i.e. about whether or not the situation meets the elements the alleged crimes)? Of particular interest are the allegations on crimes against humanity in relation to the requirement of an attack against the civilian population. The independent meaning of ‘attack’ for the purpose of crimes against humanity has not been the subject of much detailed analysis in the literature or case-law of international criminal law. If the legal debates re DPRK move forward, I would anticipate interesting developments with insights useful far beyond North Korea.